The future of the most precious resource on earth is in question. But when it comes to solving the problems, are we getting any warmer? Feature: Water On The Table (79 mins) Director Liz Marshall will be present to discuss her film. 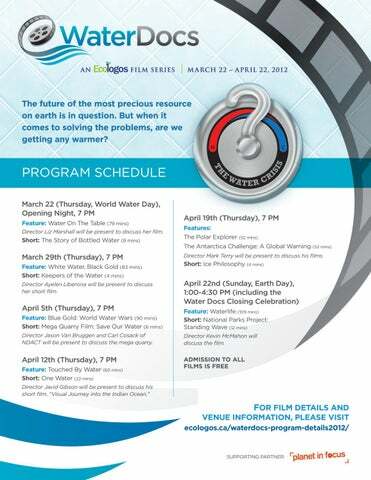 March 29th (Thursday), 7 PM Feature: White Water, Black Gold (83 mins) Short: Keepers of the Water (4 mins) Director Ayelen Liberona will be present to discuss her short film. Director Mark Terry will be present to discuss his films. Director Jason Van Bruggen and Carl Cosack of NDACT will be present to discuss the mega quarry. Director Kevin McMahon will discuss the film. 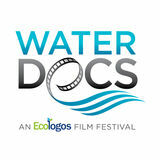 This is the Programme Guide for the inaugural 2012 Water Docs Film Festival held annually in Toronto, Ontario, Canada.